Texas Skydiving -- Make Your First Skydive Unforgettable! 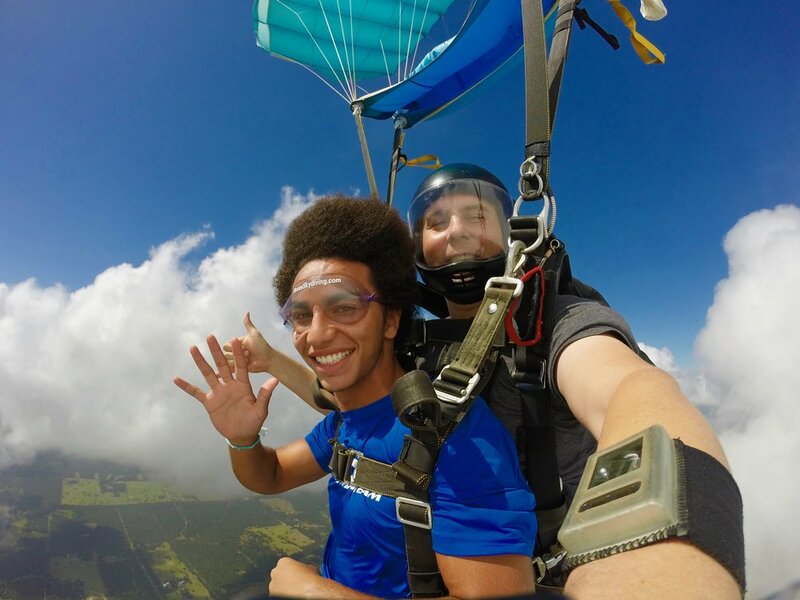 At Texas Skydiving, our highly experienced staff is ready to make your first skydiving adventure as safe and amazing as can be. We know jumping out of an airplane for the first time can seem a bit intimidating, so we strive to create a positive, fun learning environment with the highest level of individual attention possible. We also utilize the most advanced teaching methods and equipment available. Your first jump at Texas Skydiving will be a tandem skydive, in which you are attached via a harness to a USPA-Certified instructor. Tandem skydiving is by far the easiest, safest, and most cost-effective means of introduction to the sport. After arriving at the drop zone and signing in, you’ll spend 15-20 minutes training with your instructor and getting outfitted with a harness. Now you’re ready to hop in the plane for a serene and scenic ride up two miles in the air. The plane slows, the door opens, you take a deep breath, and… you’re flying!! After an amazing, adrenaline-surging 40 seconds of free-fall at 120 miles per hour, your parachute will open and you’ll begin a smooth and tranquil 5-6 minute glide back to earth. Take in the crisp, clean air and gorgeous views at altitude, and maybe even touch a cloud! Finally, prepare for a smooth and easy touch-down as your instructor expertly guides your parachute back to the landing area. If you’re looking to take it to the next level, check out our Get Licensed page and find out what it takes to become a licensed skydiver!